Can I put Ads on my Niche Website? Many people often ask themselves whether it is wise to put some ads on their Niche Website. Ultimately, it’s going to be your call. However, I wanted to touch a few important points when it comes to adding some ads because in some cases it is detrimental. In most cases, knowing what Google thinks is going to give you the answer. Since most of the other search engines try to copycat moves taken by Google, understanding what Google does is generally enough. Personally, I never read anything about the other search engines. I think that if it works for Google and since Google sends me 99% of my traffic, I don’t really have to worry too much about the other search engines. For years now Google has been working hard to implement algorithms to avoid sending their users to pages that are decidedly spam. Pages created just to entice people to click on links, buy things they do not need, etc. Does your site look like a random Thingumabob could have created it? If your site is sumptuous, looks perfect, has been refreshed over and over again, all mistakes/misspelling taken care of… that’s probably maintained by a business who has an editor who pays close attention to all sorts of details and makes sure that the website remains in good shape. Such sites are scary. They look like business sites and many people won’t feel at home on them. On the other hand, if the site looks a bit shaky or precarious in terms of design and how the site is built (without being totally unusable, of course) then you certainly can hit gold. People are much more likely to read multiple pages of your website and click links and end up generating commissions that end up in your bank account. I think that your website can look slick without all the bells and whistles. 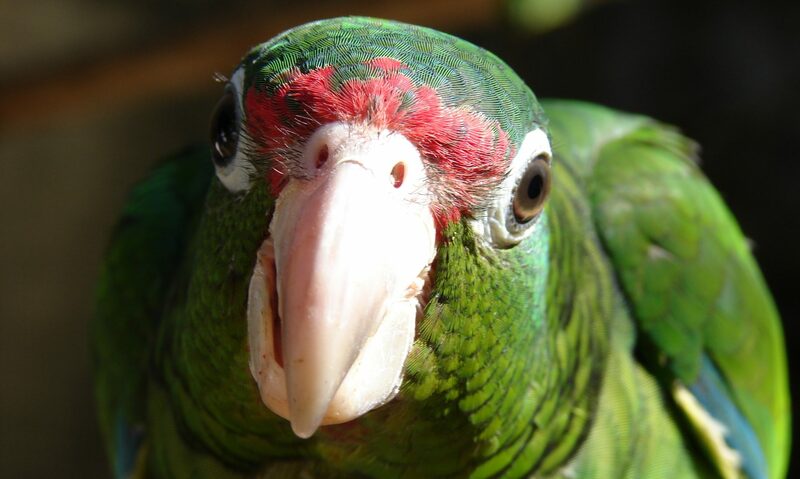 On my site here, I have a nice parrot picture at the top. But you may notice that it’s not really correctly aligned on sub-pages. That’s not exactly on purpose, however, I did not try to fix it on purpose as in: I don’t know how to make it better, I’ll leave it like that. It makes for a more real website. A super clean website looks like you have a company and many people run away from such quickly unless it is a big and well-known brand they like say… Apple or Nike. People just don’t like to be sold to. You have to use subtle hints and entice them by letting them know that the product or service you mention and link to are worth their while by explaining what you like, the pros and cons, etc. Also, your website can have pages without any affiliate links (or at least very few). The wrapping paper not too far—i.e. you just received it! So a way that shows that it’s real and not a photo taken by a professional photographer for a $200/hr commission. The photos on Amazon.com are generally that type and those are the wrong type for your website. Okay, so now that we have a basic idea of how your website should look like, we can talk further about ads. I think that there are three main types of ads you can get on your website. Of course, the number of ways to distribute the ads or how it is presented is pretty much infinite, but the idea, in the end, is that you see some text, images, a video, something. This is fairly limited today. These are often displayed at the top or bottom of your content, in the sidebar, within the content, or in a popup. Most of these ad networks have requirements for your website. For example, your site needs to be large enough (maybe requires 50 or more pages) and receive enough traffic (maybe 1,000+ a month). Read their contract carefully to see what the minimum requirements are and whether it is worth your time to even apply with them. An important note: you want these ads to look like ads. In other words, you want something to say that they are ads such as Sponsors, Advertisements. For example, the AdSense system shows AdChoices at the top of the ad. Note that you could look for an agent or use a company that does that work for you. Of course, in most cases that reverts back to (1) since most advertising companies on the Internet have everything automated and you’re not really in control. The other way I’ve seen it work is by placing an image with a link to a sponsor page. The image would say something like “Place Ad Here” and the sponsor page gives the info about how that ad placement is going to work. How much it will cost the user, how the user can verify that he’s paying the right price, what type of ads and sizes that you accept, etc. But assuming you talk directly with advertisers… they pay you directly so they can get their ad on your website. They are likely to ask for the ad to appear on all pages, although you could sell them on a per page basis to be able to get more advertisers. Only that requires you to have many pages with many hits. This method can get you pretty good chunks of money. The current value is around $1 and $5 every 1,000 hits so on a website that receives 1 million hits per month, you would get a $1,000 to $5,000 per month per ad. Don’t forget, though, that you will need to prove the worth of your website. This can be done by having a Google Analytics account and share the account in View Only mode with your potential advertiser. That way, if you said you have 1 million visitors a month and your Google Analytics shows 100,000, the advertiser will know that they should not work with you since you’re a liar. If you offer all of those possibilities, then you may want to calculate the costs to your advertiser accordingly to you various numbers. You’ll have a complicated billing! More or less, what I see from this is that you’ll have to decide on a relatively fixed price that fits you and your advertiser and stick to it. Adjust your price with each new advertiser. You will see at some point they will refuse to go for it, that’s when you’re too expensive. There are many ways to negotiate, but I’ll leave that to you because I wouldn’t want you to say that I gave you the wrong advice on that one. Since you are in full control, you won’t be obligated to put anything specific to say that the ad is an ad. However, to prevent losing ranking on Google, you want to make sure that the link is a nofollow link. See my page about anchors in regard to the nofollow (TODO: add link). These are ads created directly within your content. These ads do not generally look like ads and this is what you actually do in your content to send people to various places where they can purchase an item and you get a commission as the affiliate. In most cases, if you are an affiliate, you are much more likely to make money that way than by having an inline ad that may pay you one penny per click. A good affiliate program will generally pay you more. The PPC may look attractive because you get paid for each and every click, but the truth is that often the payments are so low that you are likely to lose your shirt over those. On the other hand, an affiliate program like the one Amazon.com offers pays commissions of 6% or 8% for many of their products. By sending people to those products and making sure the products are in the right price range, roughly between $100 and $300 a pop, you end up with $6 to $24 per sale. Not only that, Amazon.com is really good at upselling (even if that never works for me, and you may also always skip all upsells, trust me, many people fall for them all the time!) So… imagine the person going there to buy that $91.22 item you linked to and they end up purchasing this upsell and that upsell, oh and that would be useful too and they end up buying for $1,000. Now that 8% commission is going to be $80 in your wallet. To get $80, even if you get $1 per click on an Inline Ad, would take 80 clicks. I don’t think that it will take close to that many clicks to Amazon.com for you to start getting cash in your wallet, much more than the PPC otherwise offered. In this example, we also notice the target attribute which is set to _blank. This means the link defined in the href attribute will be opened in a new tab (or window). This is why we see the noopener token in the rel attribute. This means the new window won’t have access to your website window where the link appears. If their link has the target=”_blank” parameter but not the noopener, know that can cause problems because the target page has access to your page and it can hijack it. 99.99% of the time, this won’t be a problem, but the remaining chances are there that the target is a hacker who will be more than happy to create havoc and damages to your visitors. Some ads are particularly obnoxious. I’m sure you’ve seen some of them. Any ad that would annoy you even slightly, DO NOT PUT ON YOUR SITE. Popup ads that take up the whole screen after a few seconds the user got on the page. If you have one of those, it’s to build your mailing list, if you want to create such a list in the first place. Video ads that auto-play a video especially with but even without audio. The only type of video that can auto-play is one that is about the subject of your page (i.e. if you made a video talking about your content, a.k.a. a video which is pretty much one to one equivalent to your page’s content,) although even that one, I would not auto-play. Just show an image and let your website visitor click on the play button once he’s ready. Audio that starts automatically and does not give your website readers a way to turn it off. None of your readers signed up for that. Again, text and banners (images), great. With videos, be very careful. People who pay you directly to place a video ad on your site, good. Make a copy of the video on your YouTube account (and keep it as Unlisted) or your server and serve it yourself so that way you are sure it does not change on you. Otherwise, who knows what your advertiser is going to do to the video! Ads that block the content are also to be avoided. This is similar to the full-screen popup. You can see the content of the page behind the ad only said content is darkened or blurred making it unreadable, so people have to focus on the ad, are also going to anger your readers. Any type of ad that ends up taking up a lot of CPU. Many times I had to close my browser and restart to avoid that kind of stupid ad. Sure enough, I did not go back to that stupid website. Really bad choice. That’s one reason I do not use Yahoo! Search. They allowed such stupid ads for too long. Not catching one here one there, sure. But when you get just that kind of ads each time. Nope! Intermediate Page when reaching your website… that intermediate page shows you an ad. Once you’re done seeing the ad (in most cases those involve a video) you can go on to the actual content. This is similar to fully blocking the screen only you did not yet load the content of the page since the website wants to force that ad down your throat first. This is exactly what Forbes does and that’s why I never go to that newspaper online. By the way, one side effect of these bad practices is Ad Blockers. Many people (one-third of smartphone users!) won’t see those ads anyway because they will have free software searching the ads in your pages and removing them before the page gets displayed. The result is that you’re not going to get even one click, obviously. $0.00 revenue from those ads. Actually, this is why you want your genuine affiliate links in your page content and not 20 different ads. Some people may not be smart enough to know that Ad Blockers exist and can help them checking out a page without all of that annoyance. These people are probably not the ones who are going to create a link from their website that will add credibility and juice to your site. Instead, they’re probably going to close your page and never come back if they can help it. At some point, Google noticed that some websites had quite a lot of ads and yet their search engine would send many clients there. This is a problem because as a user, such ad-heavy websites first of all load very slowly and two are often quite unusable because half the ads use 100% of your CPU and when you have 20 of them, that would require your computer to have 48 CPUs to support the full load. Okay, maybe I exaggerate just a tad bit, but these are so totally unpleasant that they definitely ought to be blocked 100%. That’s what Google wanted to do on their end. These website owners can still advertise to send traffic to their website, but their organic traffic must have dwindled a lot whenever the “Top Heavy” algorithm came out. As before, if your page loads in more than 1 or 2 seconds and ads are likely to add many seconds to that, then you get penalized. The new load mechanism is probably adding the load speed of each ad that appears on the page to the basic DOM of your page and loading its images, CSS, JS, and other files. The number of ads may not in itself impact the rank of your page. However, if the number means a very slow load, it certainly will have an impact anyway. That being said, a while back Google AdSense limited you to 3 ads per page. There are no reasons to think that would not be the maximum they are looking into for one page. If your front page appears with 10 ads all around an image and no text content in your post, chances are that this page is considered pure spam and it will not only not be included in Google, it is likely to penalize the entire domain. The size per ad may play a role. For sure, if the real estate that your ads use on your page is over a certain threshold, then you most certainly get penalized more. Imagine a web page that has 50% or more of its space used up by ads. Who wants to read the content in the middle there while all those ads flicker on all sides? 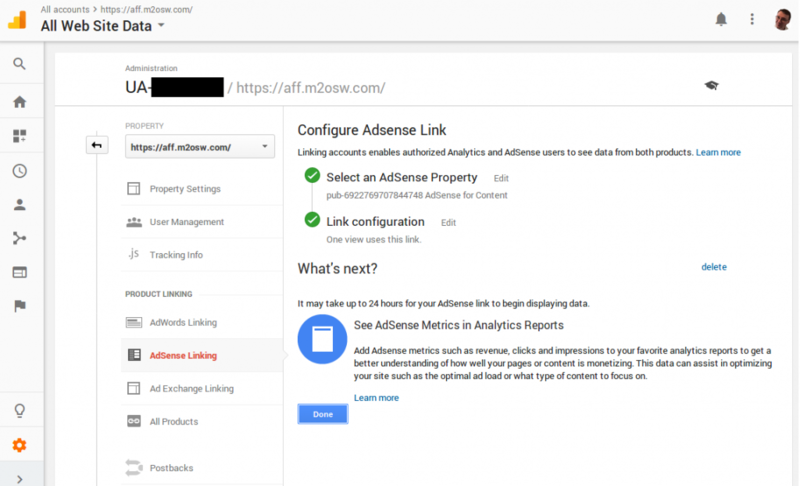 If you do have an AdSense account that you use with a given website, it is a good idea to link it to your Google Analytics account of that property (website). Click on the gear to enter your property Settings. Click on the AdSense Linking option under your Property. Select which AdSense account to add. You likely have just one. Select the View. As most, you probably have just one: “All Website Data”. Then click the Link button. As mentioned, it can take 24 hours for the data to travel from your AdSense account to your Google Analytics account. Be patient. This gives you some insight on who ends up placing advertising on your website. Once linked, return to your Google Analytics property by clicking on the Behavior button (the rectangle icon that looks like a window, in the screenshot that’s the one just over the little flag in the sidebar on the left.) This opens a list of entries one of which is called Publisher. Click on that word and then click on Overview to get started. I’m not extremely familiar with that Google Analytics feature, so I won’t try to give you more insight on it at the moment. I think it is important to know that it exists and how to access the data. Networks that offer to create Inline Ads (a.k.a. automatically link your content when it relates to a product or service) are prohibited in your Niche Website for the simple reason that they clash with your own Affiliate Links. If you do not have any Affiliate Links but still talk about many products mentioning their brands or exact product names, then you have a chance that such system works for you. Next, we learned that having too many ads on a visible page has a negative impact as per Google Top Heavy. Although there is no more limit to 3 AdSense ads on a page, they can’t cover the whole page. The limit was removed so pages that are at length like this one can have an AdSense every now and then (one per chapter, for example,) or maybe every other page on a smartphone. The AdSense change was actually to support more ads on smartphones. Since scrolling on a smartphone is considered easy, having a few more ads along the way is considered acceptable. However, just like with inline ads, having other very enticing ads throughout your page is not unlikely to get your readers away from your page and thus not clicking on your affiliate links and a click on AdSense and similar system will bring you a mere penny or two (it’s really rare to get clicks that give you a few dollars at a time) and in the end you will waste your rank for pennies. What I often do is put one AdSense in the sidebar and that’s it. If you do more there are two problems: as mentioned earlier, you are not unlikely to lose your users to those ads. Bad. And also your readers are not likely to link to your spammy site, because frankly if the pages are covered with more than a little ad on the side, they are likely to not see it as being genuine. So my recommendation is that you limit yourself between zero and one ad on a page. Anything else and you’re not likely to make more money, to the contrary. Also, whenever you set up that ad, make sure it opens the destination in another tab. That way at least your users still have your page open. They may come back to it later.